These polygons are beased on the original created 1:5M geologic maps for Mercury as published in the late 80's and early 90's as created by several authors. The original GIS conversion was completed in 1999 using older photomosaic bases as part of a larger digitization effort. To make this dataset more useful with modern data it has been smoothed (ArcGIS PAEK smoothing method with a tolerance of 10 km) and transformed (projective transformation) to align with the 2013 Messenger base map. Links used to transform the data are included with this documentation. A polyline feature class was then derived from the polygons and attributed with contact types. All datasets use the slightly smaller Mercury radius of 2439000 m rather than the Mercury 2000 radius of 2439700 m.
Geologic Map of the Bach Region of Mercury; H-15; Strom, RG, et al. Geologic Map of the Beethoven Quadrangle of Mercury; H-7; King, J.S., et al. Geologic Map of the Borealis Region of Mercury;	H-01; Grolier, M.J., et al. Geologic Map of the Discovery Quadrangle of Mercury; H-11; Trask, N.J., et al. Geologic Map of the Kuiper Quadrangle of Mercury; H-6; De Hon, Rene, et al. Geologic Map of the Michelangelo Quadrangle of Mercury;	H-12; Spudis, P.D., et al. 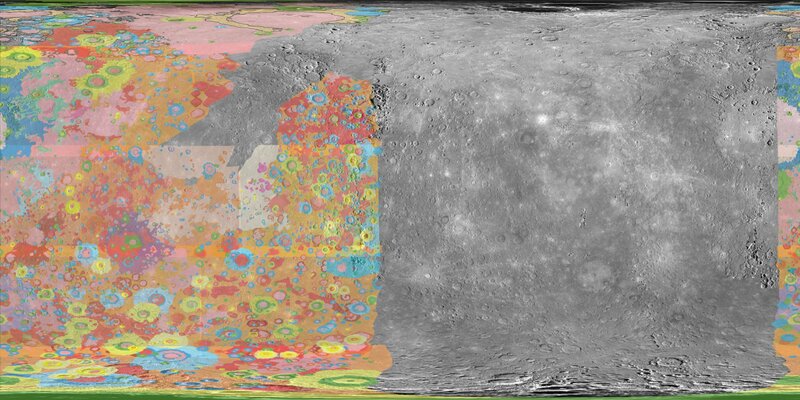 Geologic Map of the Shakespeare Quadrangle of Mercury; H-3; Guest, John, et al. Geologic Map of the Tolstoj Quadrangle of Mercury; H-8; Schaber, G.G., et al. Geologic Map of the Victoria Quadrangle of Mercury; H-2; McGill, George, et al. Updated converted GIS maps to a more current MESSENGER base map. These do not cover Mercury. Coverage only available for original maps. To make the original GIS conversion more useful with modern data it has been smoothed (ArcGIS PAEK smoothing method with a tolerance of 10 km) and transformed (projective transformation) to align with the 2013 Messenger basemap. Links used to transform the data are included with this documentation.